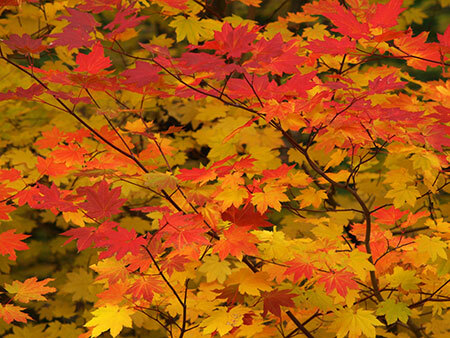 How will the summer of 2015 affect our fall colors? Oregon may not have the neon rainbow of New England’s fall colors, but we put on a pretty good show if you know where and when to look. However, 2015 will be different, as the extended drought and scorching summer heat has already affected our fall colors this year, even before the leaves began to turn. To understand why, you have to start with the basics of how leaf colors change with the seasons, and how weather and other factors influence the autumn show each year. 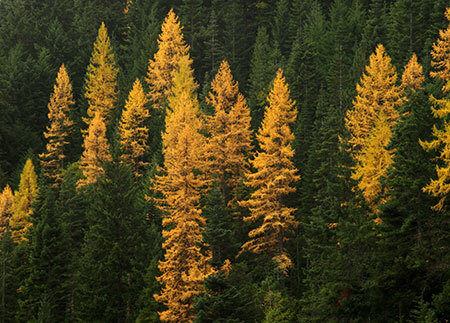 Most of our northwest deciduous trees and shrubs leaf out in spring, grow green leaves through the summer, then turn to various shades of yellow and gold in fall, with a few red leaves in the mix. Vine maple, huckleberry and mountain ash provide our most brilliant reds, and most of the larger deciduous trees in our forests turn to some shade of gold, orange or yellow. 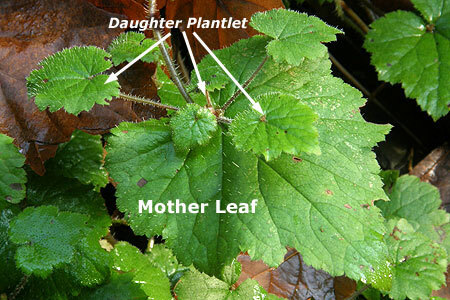 The green color in summer and spring foliage comes from chlorophyll, the amazing molecule that absorbs sunlight and allows for photosynthesis — the process by which plants convert sunlight into carbohydrates (sugars) essential to their growth. 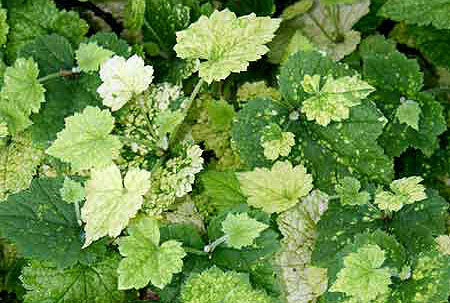 During the spring and summer growing seasons, chlorophyll is produced continually, keeping deciduous leaves green. 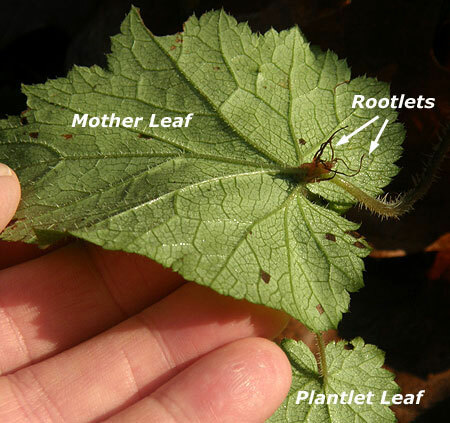 But as the days shorten with the approach of winter, the decrease in sunlight triggers a change in how cells in the stem of each leaf divide, gradually blocking the flow of both nutrients and chlorophyll to leaves. 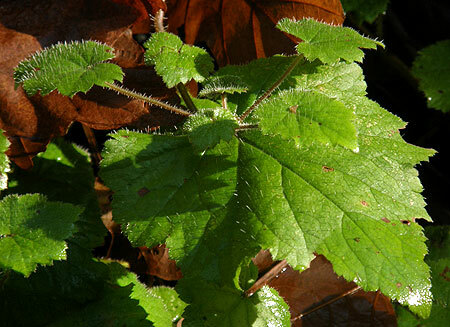 The cells that form this barrier within the leaf stem are known as the “abscission layer”. 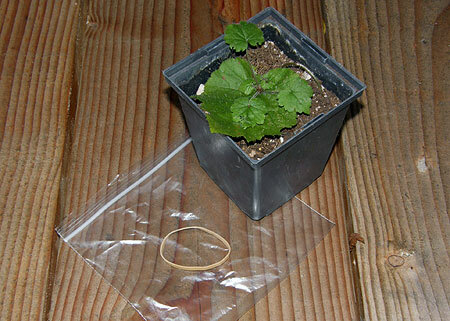 Ready for more leaf biology? Well, the yellows, reds and golds of autumn are colors that already reside in leaves, but are revealed as the change to the flow of chlorophyll is blocked by the development of the abscission layer in early fall. Yellows and golds in fall leaves come from “xanthophylls”, a pigment thought to regulate light in the photosynthesis process. 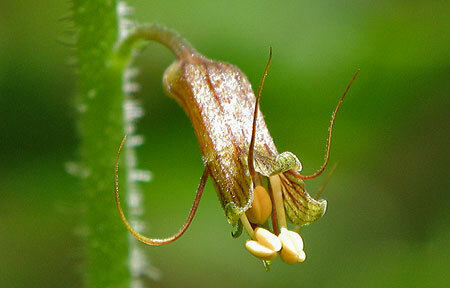 Reds and purples come from “anthocyanins”, a molecule that is believed to complement the green of cholorophyll in the photosynthesis process — but is more commonly is found in flowers, where it functions to attract pollinators. 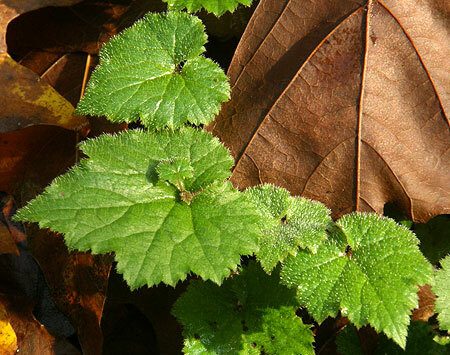 Bright sun and cool temperatures: a crisp, abrupt fall pattern speeds up and pronounces the abscission process by which chlorophyll is blocked from leaves. 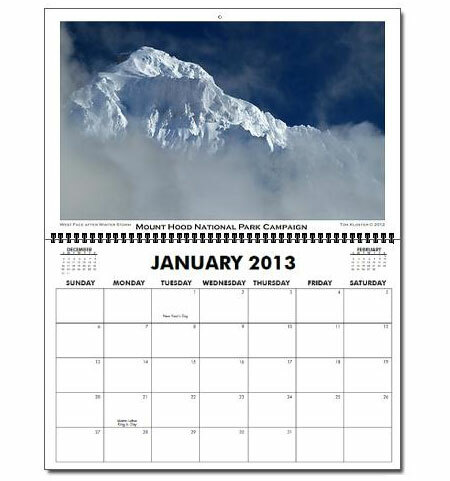 This helps to promote sudden and dramatic color shows. Likewise, a mild, extended Indian Summer tends to slow the process, with a more gradual color change and leaves changing and falling over a longer period. 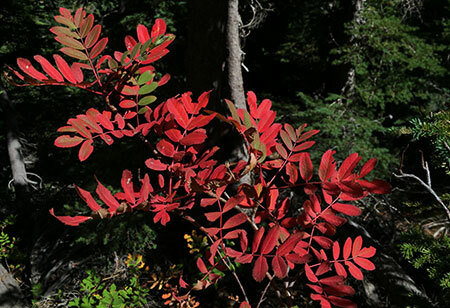 Bright days and cool nights also enhance reds and purples in plants with abundant anthocyanins in their leaves. 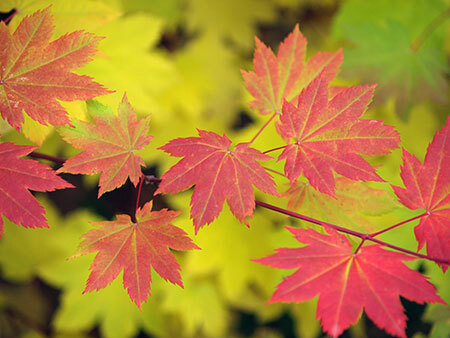 These include vine maple, huckleberry and mountain ash, our most vibrant fall foliage. That’s also why these colors are more prominent at higher elevations where bright days cool nights are guaranteed, even as the valleys are under a blanket of fog. Early frosts: contrary to popular belief, early frosts hurt fall colors more than they help, as the production of anthocyanin-based colors of red and purple are abruptly interrupted by a premature formation of the abscission layer. 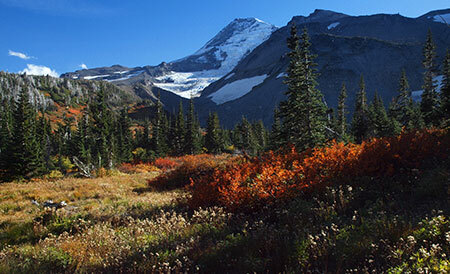 If you’ve hiked in the mountains in late August after an early cold snap, you’ve undoubtedly seen a carpet of dropped leaves under huckleberries and other deciduous shrubs. Drought: like early frosts, drought can trigger a premature formation of the abscission layer, leading to early color change and leaf drop. If you’ve been hiking in the Gorge or on Mount Hood this summer, you likely saw this effect of the drought we are experiencing. 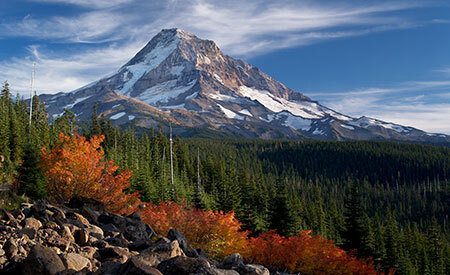 While some leaves survive later into autumn, the broader effect is a muted show, as many leaves have already dropped long before the typical fall color season. 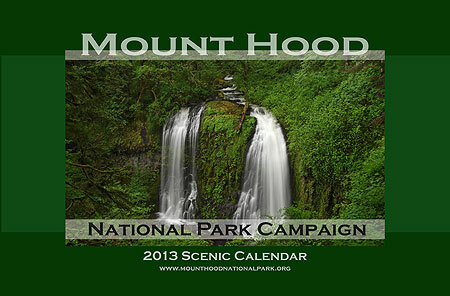 This is has already been the effect of the drought this year in both the Gorge and on Mount Hood. Early autumn storms: the arrival of a Pineapple Express storm pattern during Labor Day week of 2013 did a fine job of stripping our maples and other deciduous trees of many of their leaves weeks before they would normally turn and begin to lose their foliage. It’s not common for early storms of this magnitude in our region, so it might be the most notorious culprit in stealing our fall colors! In an ideal year, normal rainfall in spring and summer are followed by a cool, dry Indian summer with warm days and cool nights in the 40s or 50s. This year, we’ve got the Indian summer condtions, but the drought has already triggered leaf drop in a lot of our deciduous forests. Thus, we’re likely to have a so-so color display this Fall. A muted fall color display this year shouldn’t keep you from heading out to enjoy it! 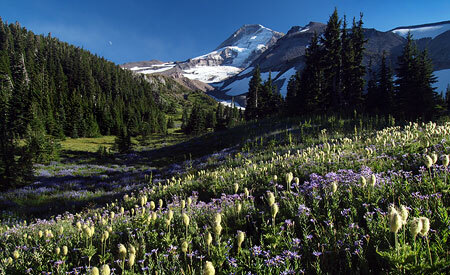 In a typical year, the high country colors peak in September through early October. 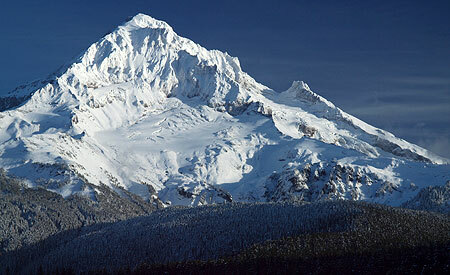 Mid-elevation areas and canyons usually peak from mid-October through mid-November, depending on the mix of tree species. 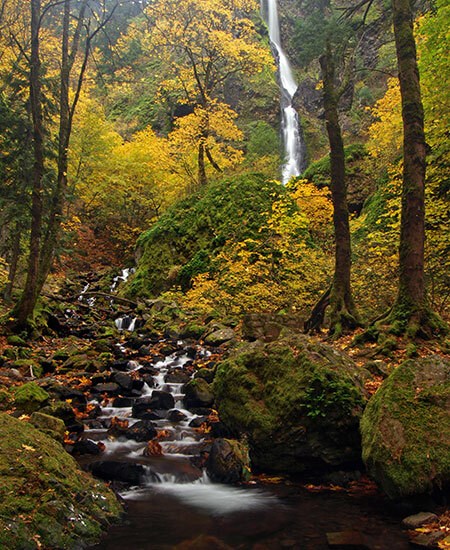 The great thing about taking in fall colors is that the weather really doesn’t matter — a soggy hike through the brilliant yellows of bigleaf and vine maple in a waterfall canyon is just as spectacular as a sunny day hiking through a sea of red and orange in Mount Hood’s huckleberry fields. Better yet, if you have kids, it’s also a great time to expose them to hiking and exploring the outdoors… though you should also plan on hauling home a hand-picked collection of autumn leaves..! 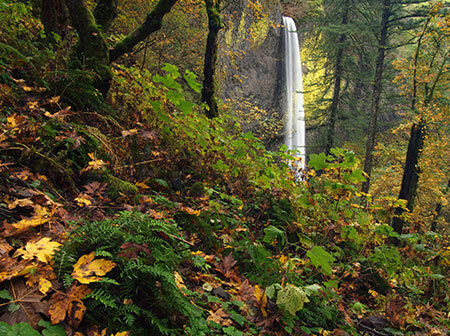 In the first part of this article, I focused on recent improvements that have greatly enhanced the Historic Columbia River Highway wayside at Latourell Falls. This article looks at the balance of Guy Talbot State Park, where a number of improvements are needed to keep pace with the ever-growing number of visitors who now hike the Latourell loop trail year-round. Hiking the loop in the traditional clockwise direction from the wayside, the first stop is bench located a few hundred yards up the trail. 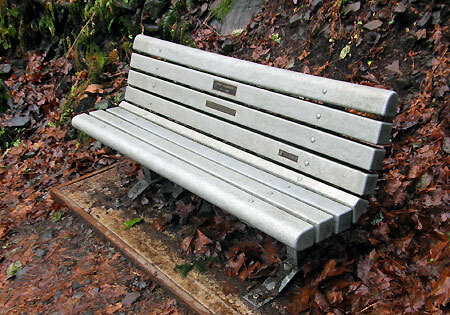 This memorial bench was donated by the Sierra Club, and though it’s not a great architectural fit for the area (a rustic style would be more appropriate), it’s still a welcome resting spot for casual hikers. If this was sanctioned “scene management” pruning, then kudos to the State Parks folks for putting classic views on their maintenance list. If this is a guerilla effort by a frustrated photographer, then perhaps State Parks managers will take note, and keep this view intact..! 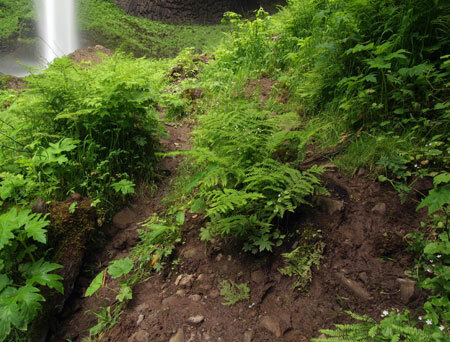 Moving up the loop, the trail soon approaches a heavily trampled bluff above Latourell Falls. Here, the first apparent problem is a decades-old shortcut at the first switchback. 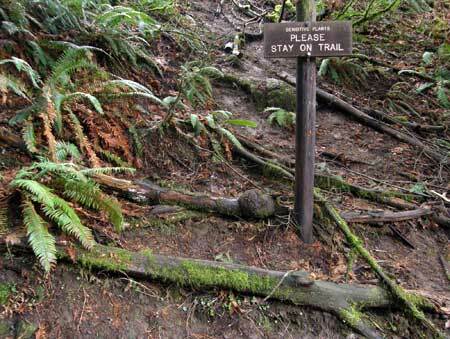 A sign begs hikers to stay on the trail to protect “sensitive plants”, but so far, the boots are winning, despite logs and debris purposely scattered across the shortcut. Tossing more logs across this shortcut might help, but borrowing an idea from the beautiful new stonework at the trailhead (or recently built stonework along the Bridal Veil Falls trail), and adding a rustic stone retaining wall here to corral traffic would be a nice option that would have lasting value. The viewpoint atop the well-worn bluff is really starting to show its age. The 1950s-vintage steel cable fence and mix of concrete and steel pipe posts were never a good aesthetic fit for the Gorge, but more importantly, they’re not doing anything. 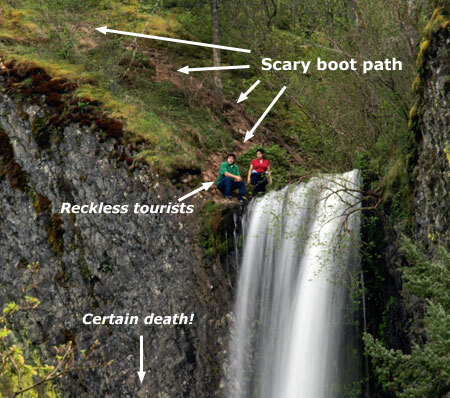 Visitors have recently pushed a scary boot path past the fence, and down to the brink of Latourell Falls (shown below), so a near-term fix is in order. The overgrown, beleaguered viewpoint at the to of the falls is in need of some TLC! The trail at the overlook has already been stomped into a wide “plaza” of sorts, and that would be a good design solution here, with a stone wall replacing the rickety old handrail. A layer of crushed gravel (another design feature of the recent improvements at Bridal Veil Falls) would further help minimize the mud slick that forms in wet months. The lone (and beleaguered) wood bench at the overlook is well-used, and a redesign should include two or three places to sit and admire the view. For most visitors who venture beyond the lower falls overlook, this bluff above the falls is the turnaround point. Adding a stone wall to better define the overlook would help curb foolhardy visitors from following the boot path to the falls brink. However, the overlook also needs some vegetation management in order to simply maintain the view back down to the trailhead — this is what most hikers who push beyond the handrails are looking for, after all. 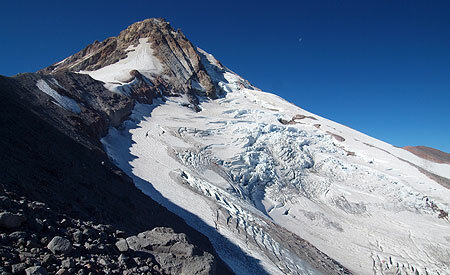 A few steps beyond the bluff overlook, an unmarked trail forks to the right, descending to Latourell Creek. 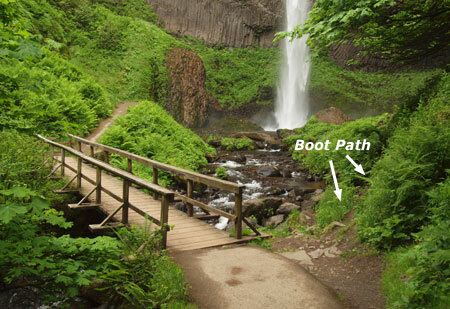 At first, this seems like another informal boot path, but a closer look reveals a well-constructed trail. In fact, this is where a lower loop once crossed the creek, connecting to the main loop where it returns (and is clearly visible) on the far side of the creek. This is an old idea that still makes sense, and should be embraced with a new bridge and refurbished connector trail. 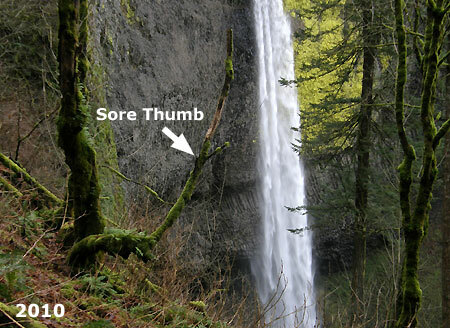 In reality, hikers are already using the lower loop, though a series of slick, dangerous logs a few yards upstream from the brink of Latourell Falls serve as the “bridge”. 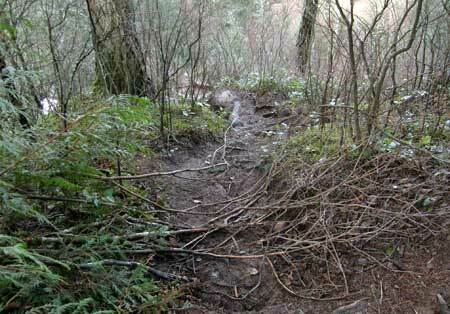 Reconnecting and restoring these old trail segments would be a good way to provide a shorter loop for less active hikers, and also resolve this hazardous crossing that is clearly too tempting for many hikers to resist. Bridge needed! 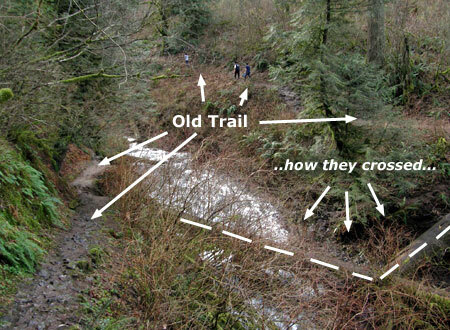 This old trail and the sketchy log crossing are an accident waiting to happen — and also an opportunity to provide an excellent short loop for hikers. 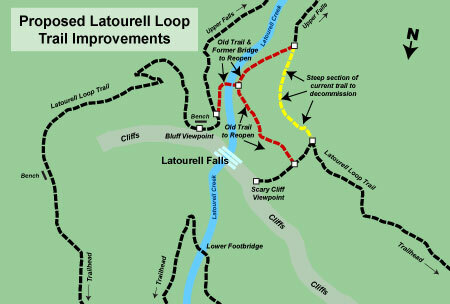 Moving along the loop to its upper end, the Latourell trail has a few issues at Upper Latourell Falls that deserve attention in the interest of protecting the lush landscape from being loved to death. 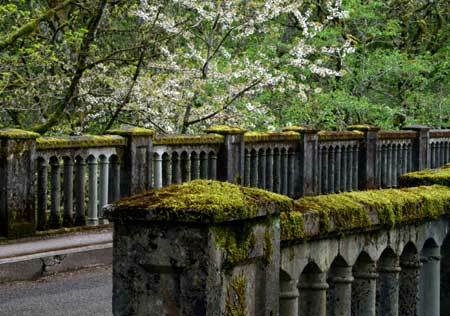 For many years, this upper section of the trail was only lightly used, but the proximity of Talbot State Park to the Portland Metro region and the family-friendly nature of this trail has clearly made the full loop a very favorite destination. The trail approach on the east side of the falls is in good shape, but problems start to emerge on the west side of the footbridge. 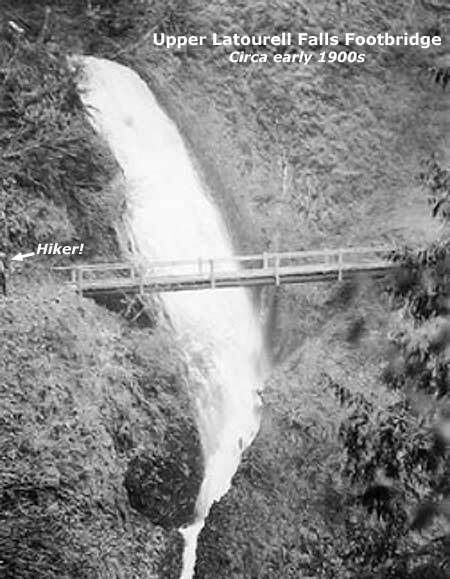 This is not coincidental, as an adventurous early trail once switch-backed up the slope on the west side, and led to a precarious bridge across the mid-section of the falls (shown below). The location of this old trail was uncovered only recently. Century-old rockwork and obvious paths heading uphill from the falls have always hinted at an old trail, but a geocache has now been placed along the old path, drawing enough visitors up the slope to add some urgency to addressing the off-trail impacts here. The best solution here is to embrace the lowest segment of the old path by repairing the stonework, or perhaps adding steps where a shortcut has formed, and provide hikers with that close-up view from behind the falls that is responsible for the bulk of the off-trail traffic (the hikers in the photo above are making this irresistible trip). 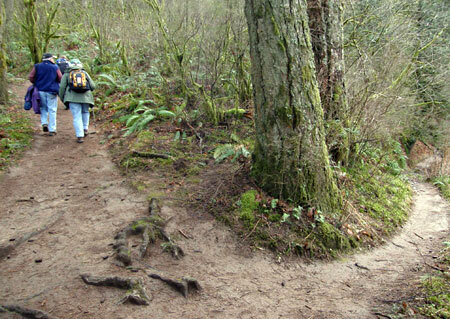 The upper sections of the old trail are much less traveled, and a simple solution here might be to simply ask the geocache owner to remove the cache. The cache risks not simply re-opening the old trail, but also bringing inexperienced hikers to the potentially dangerous rock shelf where the log footbridge once stood. If the geocache is removed soon, it’s unlikely that visitors would even notice the upper portions of this trail. Turning downstream along the west leg of the Latourell loop, the trail passes a couple of spots where some TLC is needed. First, another potentially dangerous log crossing (shown below) has drawn enough traffic to form its own boot path. It could be decades before this old log finally collapses into the creek, so a better plan is needed to stem the damage now. Sawing out the log seems possible, and is a job that could be easily in early fall, when water levels are at their lowest, and fire danger has passed. This might even be a job for volunteer trail stewards with crosscut skills. A bit further downstream along the west leg, the loop trail passes the old trail leading to the former footbridge (described previously). Here, the new trail launches uphill along a steep, slick segment built to bypass the bridge. Reopening the old trail section (and adding a new bridge) would therefore have a spinoff benefit here: not only would a shorter loop be possible (and safe), but the short, badly designed new section of the current trail (shown in yellow on the map, below) could be decommissioned, with the main route using the old section of trail, once again (shown in red). This would be a terrific project for volunteers, including bridge construction. 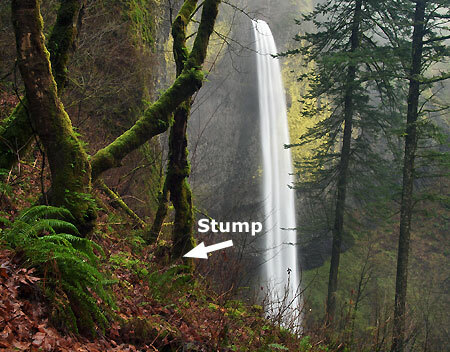 Another scary feature suddenly appears as the west leg of the loop trail curves above Latourell Falls: an old viewpoint spur trail heads straight down to a very exposed, rocky outcrop rising directly above the falls. The view from this exposed landing is impressive, but completely unsafe, given the thousands of families with young kids that walk this loop each year. There is no railing and no warning of the extreme exposure for parents attempting to keep kids in tow. 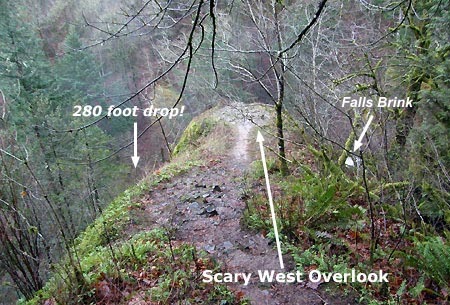 The west overlook from the trail… yikes! The safety hazards of the west overlook are twofold: certain death for someone slipping over the 280 foot sheer cliff to the north and a tempting, sloped scramble to the falls brink for daredevils and the foolhardy. 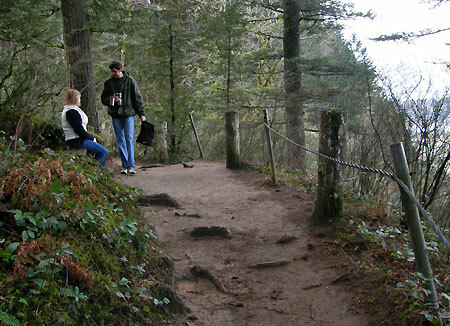 A simple solution could be a handrail or cable encircling the viewpoint, but a more elegant option would be a more permanent viewing platform in the stonework style of the improvements at the trailhead, serving both as a safety measure and to encourage visitors to comfortably enjoy the airy view. Next, the loop trail curves away from the creek and out of Latourell canyon, passing an overgrown viewpoint (that probably deserves to be retired), then descending in a long switchback to the Historic Columbia River Highway. Here, the route crosses the road, and resumes on an attractive path that suddenly ends in the Talbot State Park picnic area. 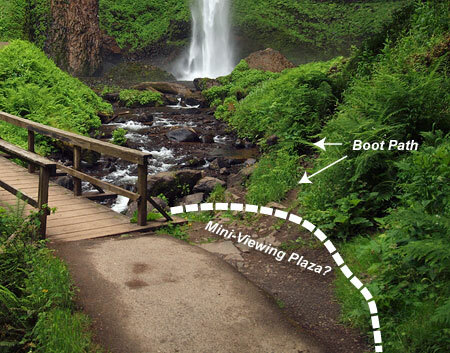 Though a bit of searching gets most hikers to the resumption of the loop hike, some signage would be helpful here — both to direct loop hikers back to the main trailhead, but also pointing picnickers to trail to both the upper and main waterfalls. 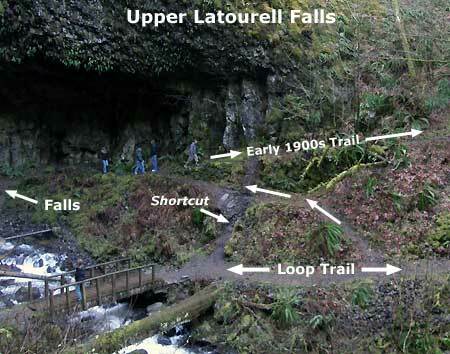 Beyond the picnic area, the trail re-enters Latourell canyon and quickly descends to the base of Latourell Falls, the final area where loop trail improvements are sorely needed. At this point along the loop, we are within a few hundred yards of the main trailhead and wayside, so the crush of year-round visitors is evident everywhere — and thus the paved trail surface in this portion of the loop. 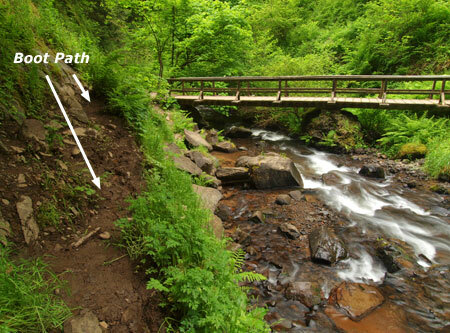 Most of the human impact is absorbed by the trail, but in recent years a messy boot path has developed along the west side of the creek, starting at the lower footbridge, and branching as it heads toward the base of the falls. There isn’t a good way to convert this boot path into a formal spur or viewpoint because of the unstable slopes and visual impact it would create, so the challenge is how to best manage the off-trail activity. The simplest option would be an extension of the bridge hand-rail to block the boot path, making off-trail exploring a bit harder. But there is also an opportunity to embrace the first part of the boot path, where a “mud plaza” of sorts has been stomped into the ground. This spot features one of the best angles for photographing the falls, after all, so a stone masonry mini-plaza with seating would be a terrific way to both discourage the off-trail travel, and give waterfall admirers an inviting place to stop and photograph the falls, out of the main flow of foot traffic. 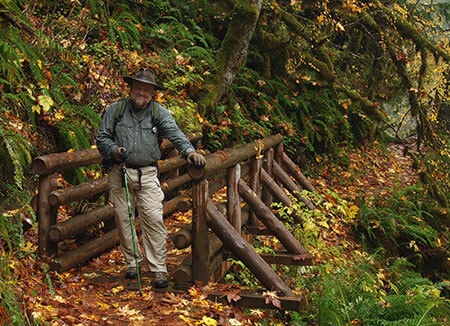 One last bit of unfinished business at Talbot State Park is a debt of gratitude to Guy Talbot, himself. At the west end of the historic highway bridge, a large gravel pullout serves as overflow parking for this popular park. The loop trail crosses the highway near the pullout and in recent years, heavy use has turned this into an overflow trailhead, as well. At first glance, it seems nothing more than a broad, gravel shoulder. 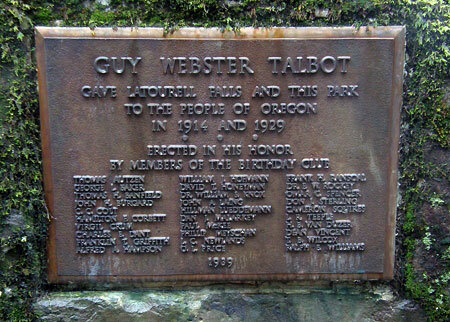 But upon closer inspection, it’s home to the only real monument to Guy Webster Talbot — the man whose profound generosity spared Latourell Falls from some other fate, and gave us the park that we know today. After all, the property wasn’t simply an undeveloped tract of forest, but rather, Talbot’s beloved country home. 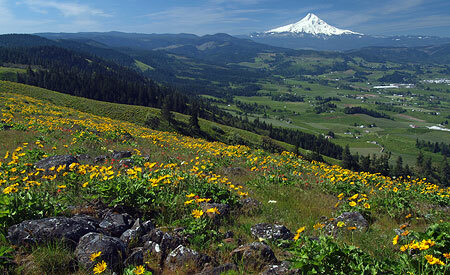 He gave the place he loved most to all Oregonians, in perpetuity. Few traces of Talbot’s home and the surrounding estate survive, so this would be the perfect spot for a third interpretive sign (the first two are on the east end of the bridge, at the refurbished wayside) focused on Talbot, and why he was such an important historical figure in history of the area. The pullout, itself, could also be improved to become a more formal secondary trailhead for the loop, as well — perhaps not as substantial as the newly rebuilt main trailhead and wayside at the other end of the bridge, but something better than the pothole-covered pullout that exists today. Finally, there’s one more interpretive opportunity near the Guy Talbot memorial: a tale of two bridges. One is the towering, 300-foot long Latourell Bridge along the old highway, to the east. The unique history of its construction in 1914 is a story that should be told, especially since visitors can walk both sides of the bridge on the beautifully designed, original sidewalks. 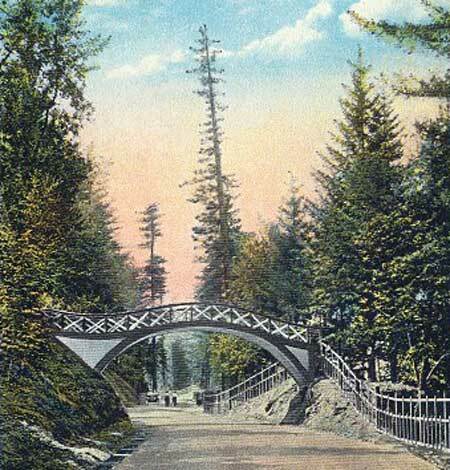 The second bridge is a curious phantom of history — a former footbridge that once connected the two halves of the Talbot property in an elaborate, Venetian-style arch. Though long gone, the footings for the bridge can still be seen, and are a reminder of the elegance of days gone by. 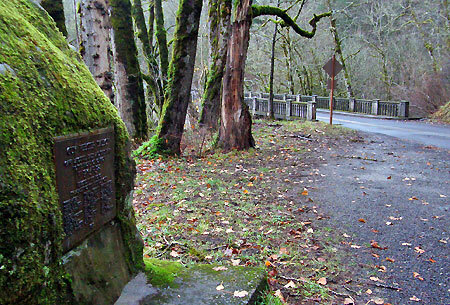 The good news is that both the Oregon State Parks and Oregon Department of Transportation (ODOT) are on a roll when it comes to enhancing the Historic Columbia River Highway trails and waysides. 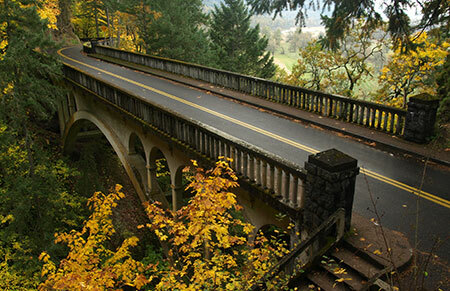 Many recent improvements to the Gorge parks and the old highway, itself, have already been completed in recent years, and more are already under construction. 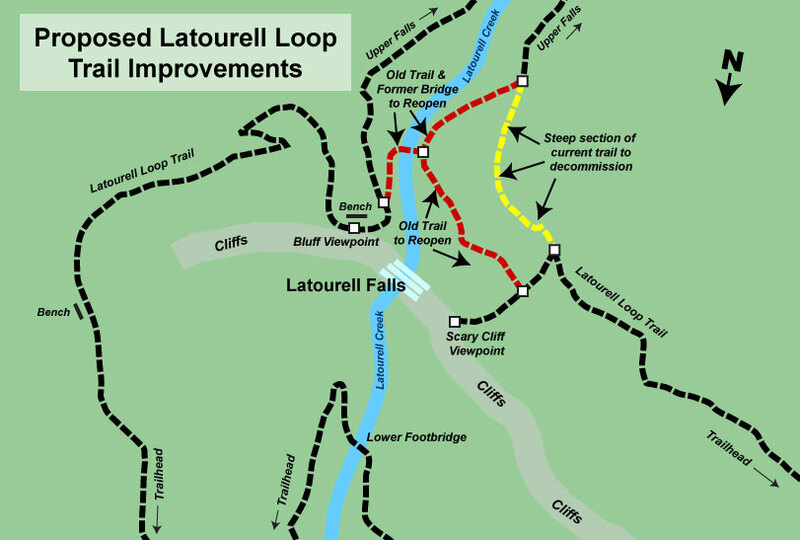 Hopefully, polishing up the rest of the Latourell Falls loop and Talbot State Park can find its way into the State Parks and ODOT work program, too! 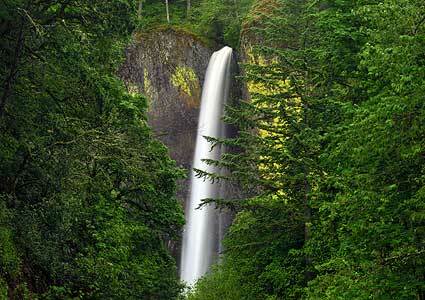 Addendum: after posting this article, I heard from the owner of the geocache mentioned above Upper Latourell Falls. File this under the “small world” department, but it also happened to be someone I’ve known for many years, and who sets the highest standard for conservation ethics. Had I checked the cache ownership and known this, it would have erased any concerns about potential impacts the cache will have on the area. I now know it is in very good hands! The cache owner also shared some numbers behind the cache that support that last point: only 50 users have logged it in the 3-plus years since it was placed, so not enough to have a noticeable impact on the terrain. 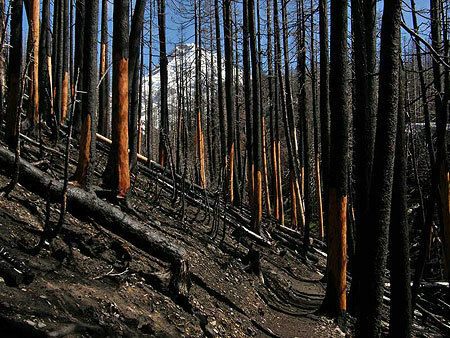 Thus, the impacts that we’ve seen in recent years are likely just more of what we see elsewhere on the loop, where the crush of thousands off feet hitting this trail each year is running the landscape a bit ragged. 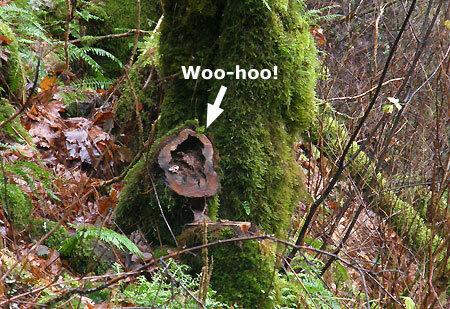 At its core, geocaching is a terrific way to introduce people (and especially children) to our public lands, which in turn, helps create advocates for conservation — something very much in line with this blog. 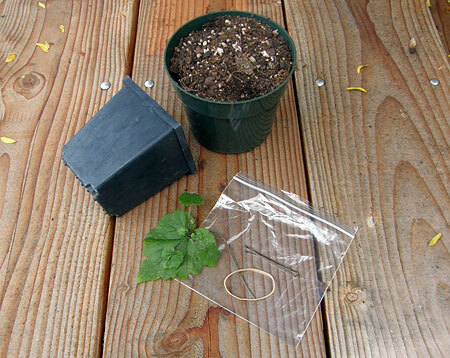 Hopefully this article didn’t leave other geocachers thinking otherwise. After all, I own several caches myself, and like most cache owners, do my best to ensure they bring people into the wilds while also having minimal impact on the landscape. 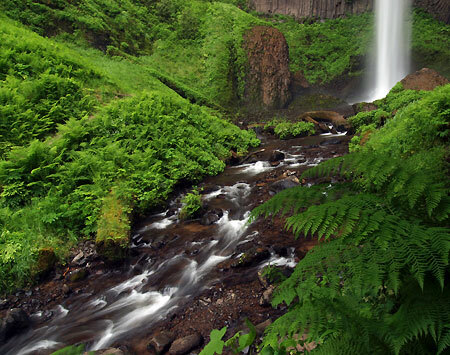 Since tourists first began exploring Samuel Lancaster’s graceful new Columbia River Highway in 1915, Latourell Falls has been a favorite stop. 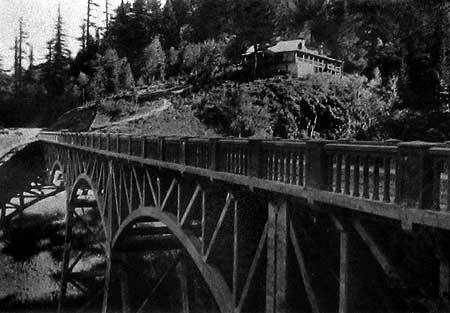 In the early days, a pair of roadhouses (the Falls Chalet and the Falls Villa) flanked the highway at the east end of the dramatic highway bridge spanning the creek, and offered lunch with a view of the falls. 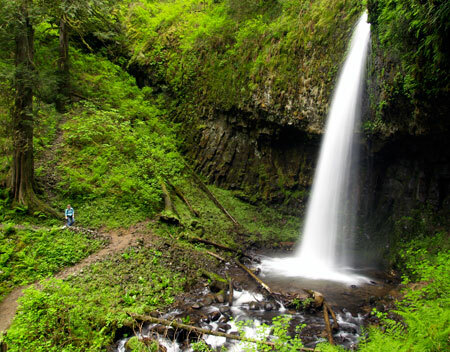 Today, the falls are the main focus of Guy Talbot State Park, with thousands of visitors each year exploring the series of loop trails that circle the lower falls and follow Latourell Creek to the upper falls. 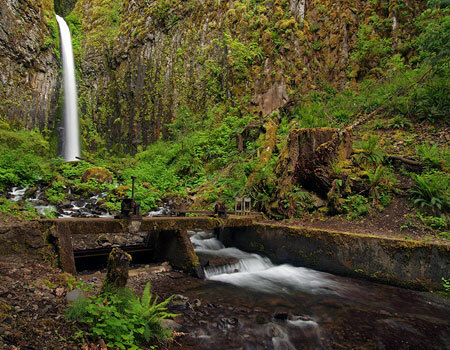 The scenes along Latourell Creek are beautiful and iconic, and most visitors simply accept that this place will be protected forever for the public. 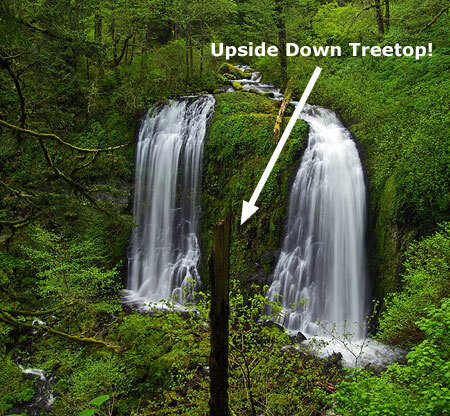 Yet, experienced hikers notice something different about this western-most of the waterfall trails in the Columbia Gorge: it’s not pristine, at least not in the way that other streams in the Gorge are. 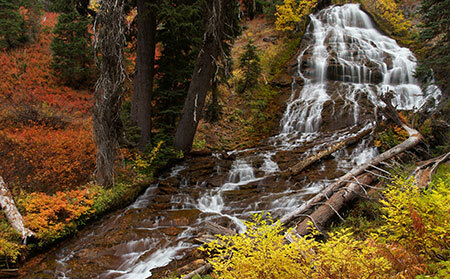 Despite the beautiful setting, big trees, wildflowers and waterfalls, something about this stream seems degraded. 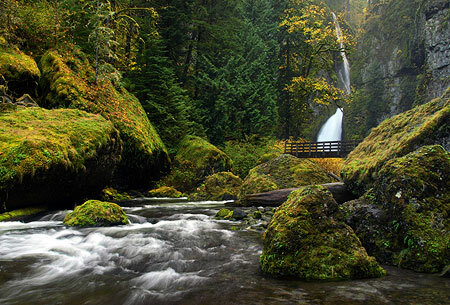 When crossing the rustic footbridge at the thundering base of Latourell Falls, there is often a distinct odor of algae in the air. A closer look at the stream reveals not only algae on the rocks, but also crusty mineral deposits that also suggest degraded water quality in this beautiful stream, and would help explain the algae blooms. 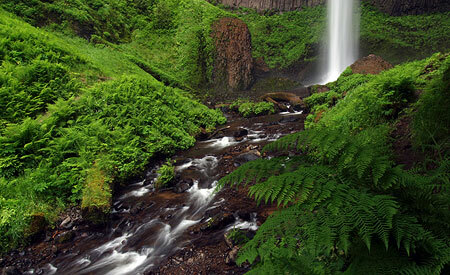 This close-up view (below) is a detailed look at the lower right corner of the previous image of Latourell Falls. The close-up view reveals white mineral deposits and yellow-grown algae stains on several boulders and cobbles. This view also shows fine silt deposits (brown areas in the lower right) that suggest some sort of major disturbance in the watershed. Why is this? 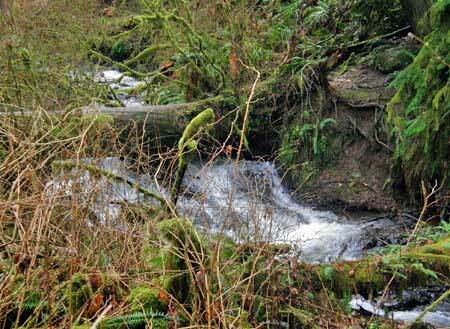 What’s behind the water quality problems on this otherwise untouched stream? 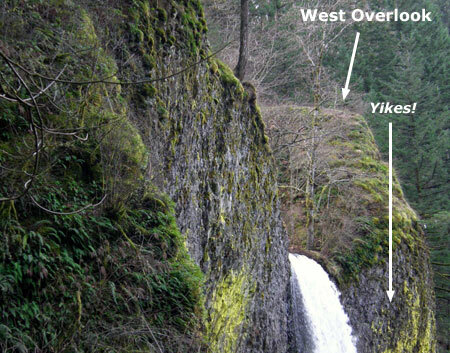 Upstream from the waterfalls and throngs of visitors along the lower canyon section of Latourell Creek, an explanation for the degraded water quality is revealed. 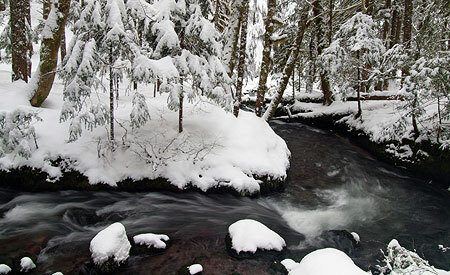 Though few visitors to the lower reaches of the stream would imagine it, the headwaters of Latourell Creek are privately owned, with a number of homes and a lot of logging along the stream. 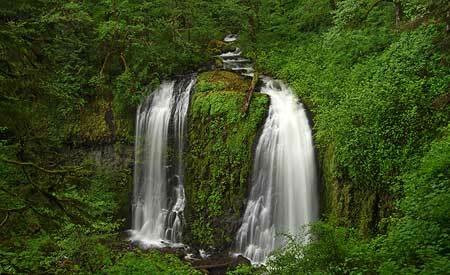 Amazingly, more than three quarters of the Latourell Creek watershed lies outside the protection of public parks and the Columbia River Gorge National Scenic Area (CRGNSA). 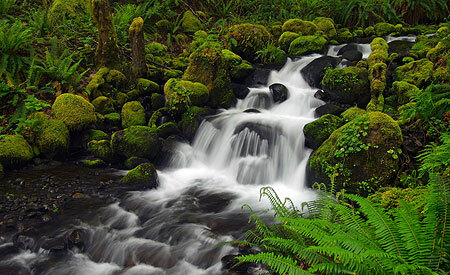 While the private homes are partly responsible for the nutrients that feed algae and leave mineral deposits in Latourell Creek (from lawn chemicals, septic tanks and other sources), the aggressive logging of private lands in the upper watershed is the greatest risk to stream quality. The environmental impact of logging in the headwaters is painfully obvious, with canyon slopes recklessly harvested in clearcuts. This is a discredited, outmoded form of timber management that shouldn’t be practiced anywhere, much less a stream of this caliber that flows into a National Scenic Area. The clearcut photos shown here were taken in the summer of 2010, with most of these harvests just a couple of years old. 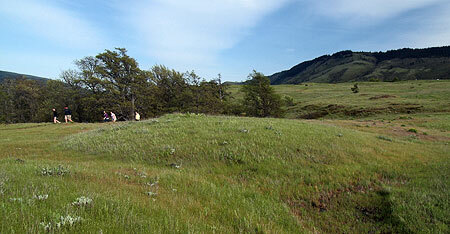 In this view (below), an older clear cut can also be seen on the hillside across the canyon, and is just beginning to recover with a light green layer of growth. Most of these forests have been cut several times, with ever-shortened growth cycles between harvests, thanks to a growing market value for marginal timber. 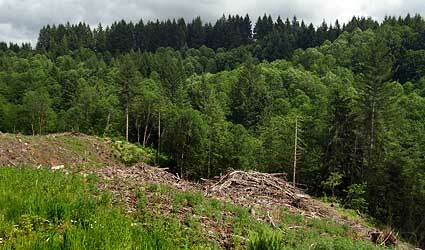 In this view (below) raw skid roads in the lower right drain directly into Latourell Creek, which flows along the tree line, at the edge of the clearcut. 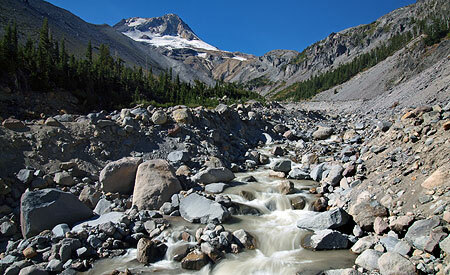 Erosion from bare slopes and logging roads is responsible for the most fine sediments (mud) seen below, in the protected sections of Latourell Creek. 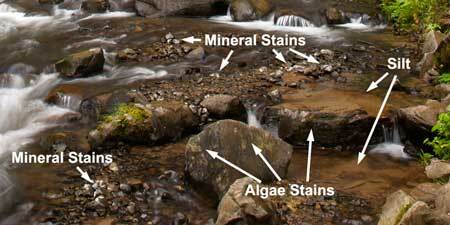 These sediments not only spoil the stream bottom, they also introduce minerals at a rate which promotes the growth of algae, which in turn, can also harm stream health. 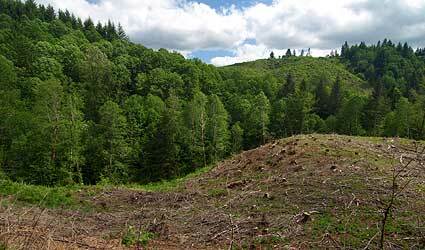 Sadly, Oregon law continues to allow timber harvesting using the clearcut method, and the few environmental protections that do exist for stream protection on private timberlands are little compensation for the effects of clear cutting. 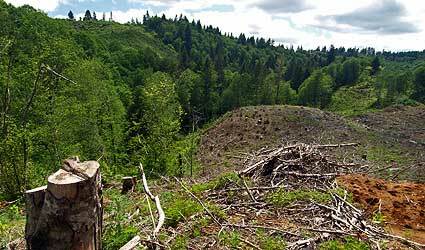 The tragic reality is that in Oregon, the timber lobby is still king. Twenty years of non-stop public relations advertising (kicked off during the early 90s Spotted Owl crisis) by Big Timber have been surprisingly effective in keeping the public largely misinformed on what is really happening in private forests. In this view (below) of upper Latourell Creek, the private property owner has left the minimal amount of riparian “buffer” required by Oregon law. The trees in this photo are less than ten feet from the edge of Latourell Creek, and most of what you see is actually growing on the opposite bank from the clearcut. Clearly, this practice threatens severe erosion and sediments from the logged area entering the stream in a region where rainfall amounts can reach 100 inches annually. 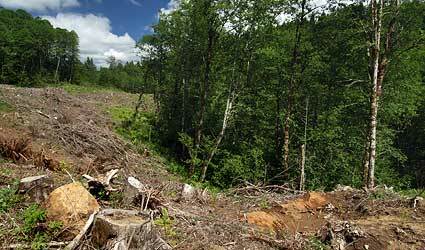 Clearcuts threaten more than steams and water quality, however. 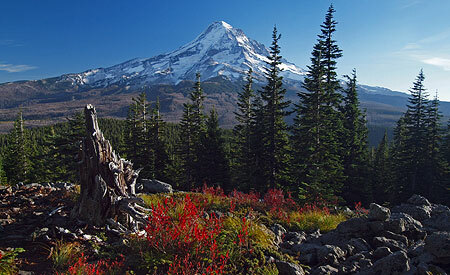 In the 1990s, the Oregon timber lobby was forced to accept limits on clearcutting above roads and dwellings because of a number of catastrophic slides that had been triggered around the state by the practice. Yet, few limits on logging below developed roads exist, and in the case of the upper Latourell canyon clearcuts, the impact of logging on the slopes below the local roadways is real. 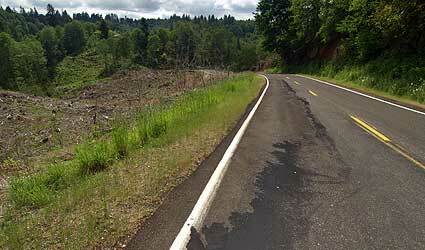 In the following view, large trees have not only been recklessly cut from the slope below the road, but the remaining smaller trees and shrubs have been sprayed with herbicide — a routine treatment after clearcutting — and thus killing what was left of root systems that help hold the slope together. As the image indicates, there are already active slides along this slope, triggering road repair costs that will fall upon the public to fix, not the private land owner. 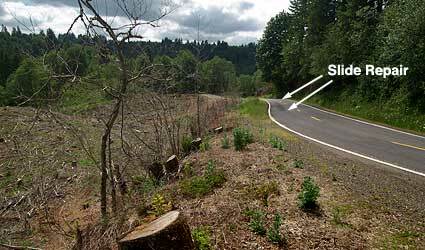 This photo (below) shows the slide repair in more detail — a 200-foot section of road that has already been filled and patched repeatedly, and now will likely continue to fail thanks to a slope that has been further destabilized by aggressive logging. For much of Oregon, the fate of clearcutting is an open question, with the timber lobby thus far successful in its efforts to prevent the practice from being outlawed. That’s a shame, and a sad commentary on our state politics. 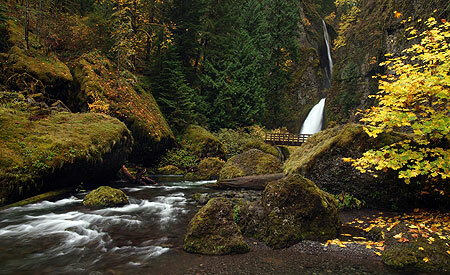 But in the case of Latourell Creek, there’s another option. 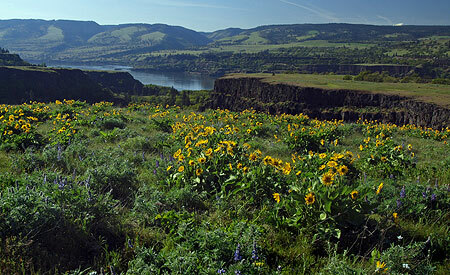 When the authors of the Columbia River National Scenic Area (CRNSA) were drawing up maps, they focused on scenery and what could be seen from points along the Columbia River. As a result, the scenic act ignored a crucial lesson learned from the newer national parks of the 1960s — most notoriously, Redwoods National Park — that when acquiring park lands, complete ecosystems and watersheds should define the boundaries. 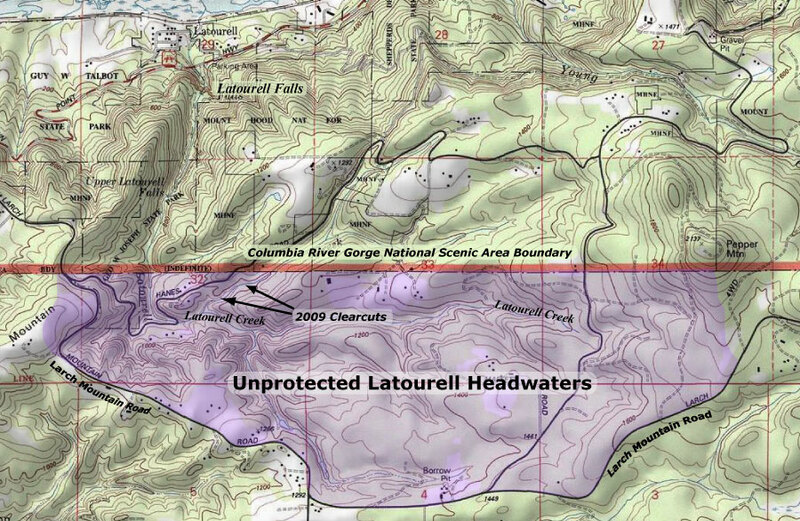 A look at the CRNSA boundary in the Latourell Creek headwaters shows the problem: the upper watershed falls outside the scenic area, and thus is excluded as a place for meaningful regulation or public land acquisition. It doesn’t have to be this way, however. These lands should be added to the CRNSA, and managed holistically, with the health of the spectacular lower canyon in mind. 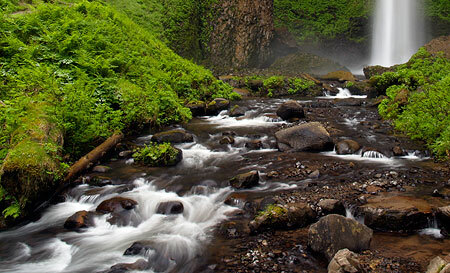 After all, Latourell Creek is the only major stream on the Oregon side of the Gorge to straddle the boundary, and thus a good case can be made for amending the CRNSA boundary to incorporate the complete watershed. This would allow for better regulation of private lands in the headwaters, at a minimum, and also allow for CRNSA land acquisition funds to be used here. Another argument in favor of expanding the CRNSA boundary is the convenience of Larch Mountain Road in defining the Latourell Creek watershed. This popular recreation route is already viewed as “part” of the scenic area, albeit outside the boundary in this section. 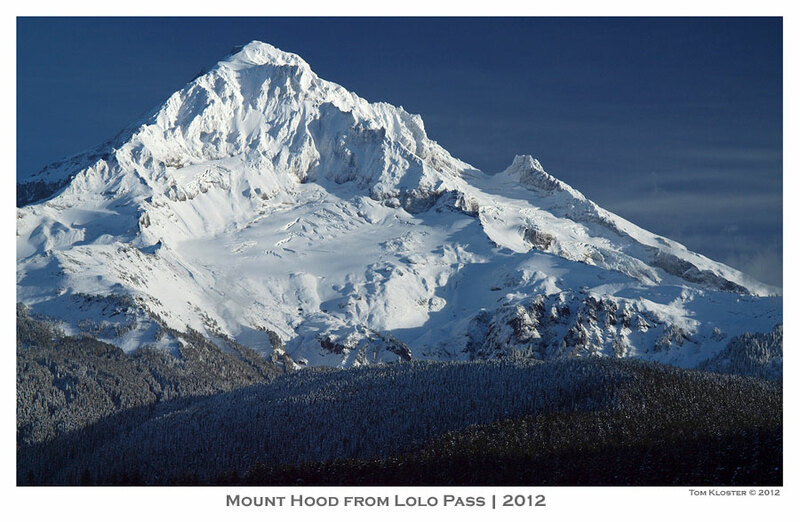 Therefore, an expanded boundary would allow the full Larch Mountain Road corridor to be managed as an extension of the scenic area. 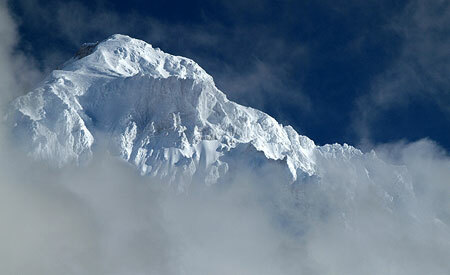 This extent is reflected on the map, above. Amending the CRNSA requires an act of Congress, and though it sounds daunting, minor changes to federal boundaries of this sort are common as “riders” on larger federal lands bills. While better regulation of private lands in the upper Latourell watershed would surely come from an expanded CRNSA, the chief benefit would be the ability to acquire lands for restoration. 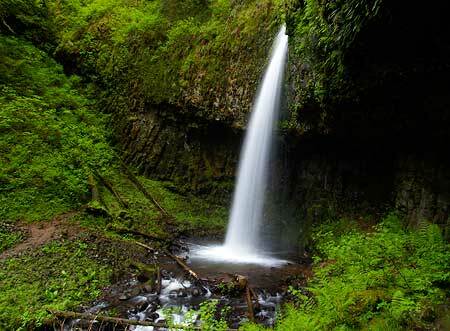 Already, the Forest Service has acquired hundreds of acres of private elsewhere in the Gorge, and the upper reaches of Latourell Creek would be best protected by fully restoring the watershed. 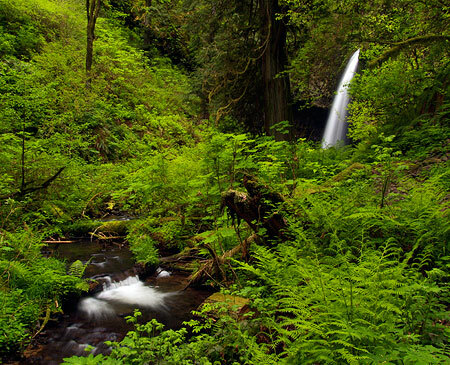 Yet another option could be for advocacy organizations — like the Friends of the Columbia Gorge or Trust for Public Lands — to acquire the upper watershed lands. However, these groups generally operate inside the existing CRNSA boundary, and focus limited funds on still-pristine lands or those with exceptional scenic value. In the end, it seems that our best bet is for the Oregon Congressional delegation to consider a “housekeeping” update to the CRNSA, including boundary refinements. Perhaps a 20-year review of the CRNSA is in order in 2016?